The Government of India have received a request from Mr. Gandhi to forward a short letter from himself to Mr. Jinnah expressing a wish to meet him. 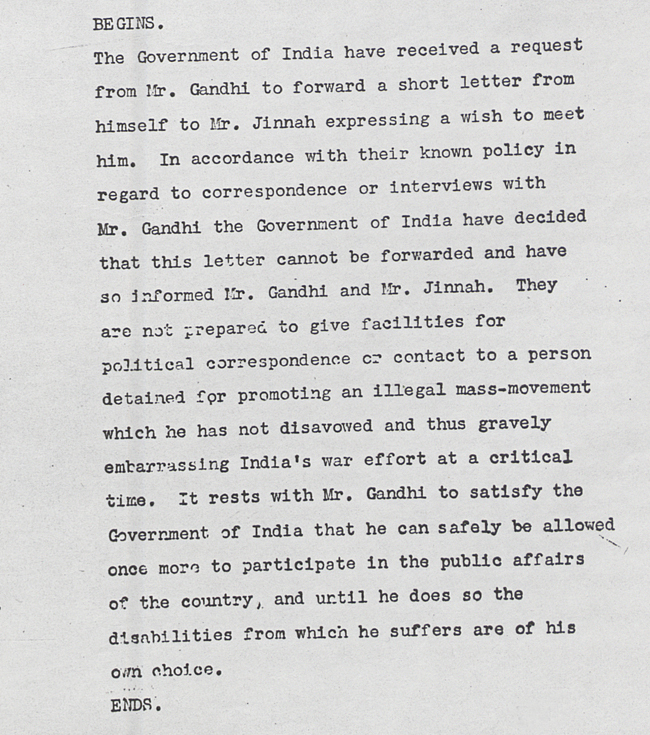 In accordance with their known policy in regard to correspondence or interviews with Mr. Gandhi the Government of India have decided that this letter cannot be forwarded and have so informed Mr. Gandhi and Mr. Jinnah. They are not prepared to give facilities for political correspondence or contact to a person detained for promoting an illegal mass-movement which he has not disavowed and thus gravely embarrassing India’s war effort at a critical time. It rests with Mr. Gandhi to satisfy the Government of India that he can safely be allowed once more to participate in the public affairs of the country, and until he does so the disabilities from which he suffers are of his own choice.